Peru Hop Cusco Office – If looking to visit our sales office in Cusco click here. Peru Hop Private Departure Terminal– Our terminal opens 1h before departure time only. Note: Our terminal and sales office are in different places. Where is Cusco located and how to get there – Compare transportation options. Must do in Cusco– A list of the most popular activities for travellers. 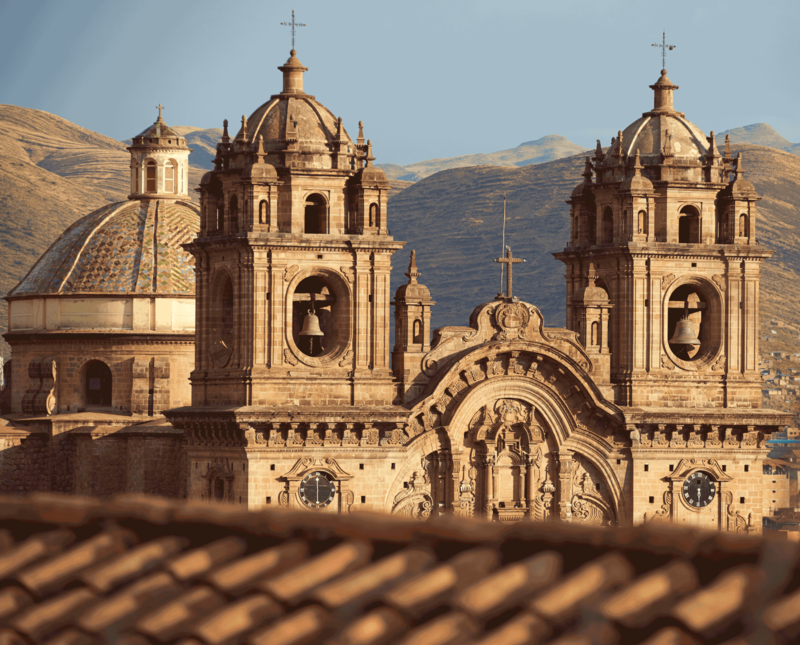 Must see in Cusco– The sights you cannot miss. Cusco safety tips– Safety issues to be aware of. Photo Gallery– A few of the best photos of Cusco. Below we have created our extensive guide to Cusco based on our expert local knowledge having helped to transport over 140,000 tourists here since our formation in 2013. Cusco is located in the Andes of Peru and is accessible via land or by air. Below is a summary of the main options you have to get to Cusco. Although Peru’s most touristic city, Cusco’s airport only receives international flights from La Paz and Bogota. From within Peru, the airport receives flights from Lima, Arequipa, Juliaca and Puerto Maldonado. Upon arrival to the airport take a 15 minute taxi drive to Plaza de Armas where most hotels and hostels are located. There are many public bus companies that go from all over Peru to Cusco. A bus ride from Lima to Cusco would approximately take 22 hours with no stops while going through windy roads. Accidents are frequent, however, the more expensive choices tend to be much safer. Upon arrival to the bus terminal, you’ll have to take a taxi to the Plaza de Armas. Peru Hop offers bus tickets to Cusco from Lima, La Paz and other cities in Peru and Bolivia. These private hop-on, hop-off bus tickets include stops along the way with flexibility based on your desired travel plans letting you decide how long you’d like to stay in each destination, with on-board bilingual assistance on all buses, discounts in accommodation and restaurants. Once in Cusco, private taxis will be aranged to drop you off right outside your hotel/hostel. Check out the How It Works page to learn more! Most travellers use Cusco as their base to begin a tour or trek to The Lost City of the Incas – more famously known as Machu Picchu. 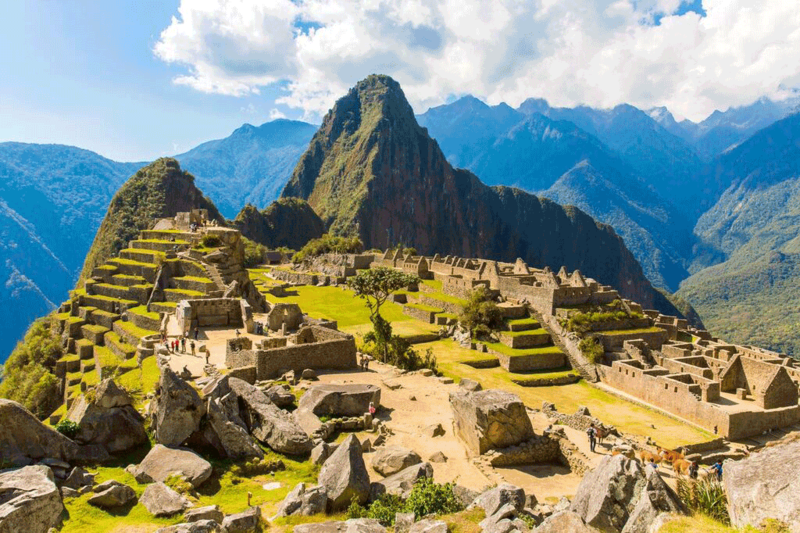 This Inca citadel is one of the Seven Wonders of the World for a reason, dating back to the 15th century, it is believed to have been a royal estate or sacred religious site for Inca leaders. There are a variety of options for getting there, from the Classic Inca Trail, the Inca Jungle Trek, the Salkantay Trek, to taking the train. Machu Picchu is a definite must do. For more information see our page on Machu Picchu. 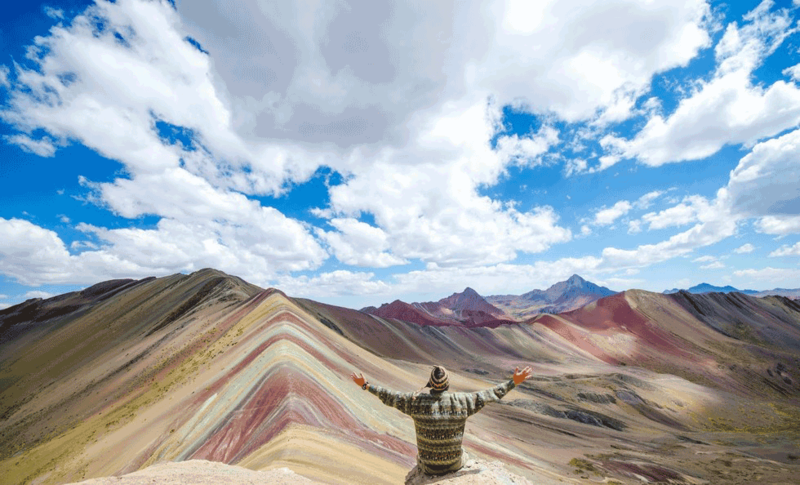 Rainbow Mountain should be on everyones checklist in Cusco. As fascinating as Machu Picchu, the mountain offers a scenery full of colors created by the minerals in the area. Only recently discovered due to the ice on the mountains melting, Peru’s Ministry of Tourism has deemed it as a must visit in all of the country. For more information on Rainbow Mountain click here. Take a day tour and explore the Sacred Valley, which is full of Incan culture and ruins. Take a trip to Ollantaytambo, one of the last Incan towns to fall, with ruins worth seeing or to Tipon where you can see some of the fascinating agricultural terracing and Incan irrigation systems. Go whitewater rafting, canoeing, take a day out on a quad bike, go horse riding in the valley, go paragliding or even bungee jumping…Cusco really has it all! The nightlife in Cusco is excellent and is renowned as the craziest place to party in Peru. There are bars, restaurants and clubs all situated within and around Plaza de Armas just a walk away from most hostels. Most clubs offer 1 free drink to entice entry, perfect for the traveller on a tight budget. In addition to the nightly fiestas, Cusco celebrates a number of festivals throughout the year with some of the biggest ones occurring in June, July and around New Year’s. See all the craft and produce at the Pisac market. Discover the historic city filled with a mixture of Incan and Spaniard influences. Gaze at the stars at the Cusco Planetarium. Many tourists allow up to 10 days experiencing Cusco but in truth it would take much longer to see everything Cusco has to offer. Walking through the city’s cobbled streets there are Incan buildings and colonial style structures everywhere just waiting to be discovered. Alternative,ly you could simply just take a walk around the beautiful neighboring area of San Blas or head to one of the miradors for a picturesque view of Cusco. If you have time, take a trip to San Pedro Market to see how day to day life is in Cusco. Here you won’t find handicrafts or lots of souvenirs but it is a bustling hive of activity for the local Peruvians. In Plaza San Francisco, only a few blocks from the Plaza de Armas (main centre – all hostels located here), you will find many nice cafes and also the main market selling a mix of items including clothing and souvenirs. 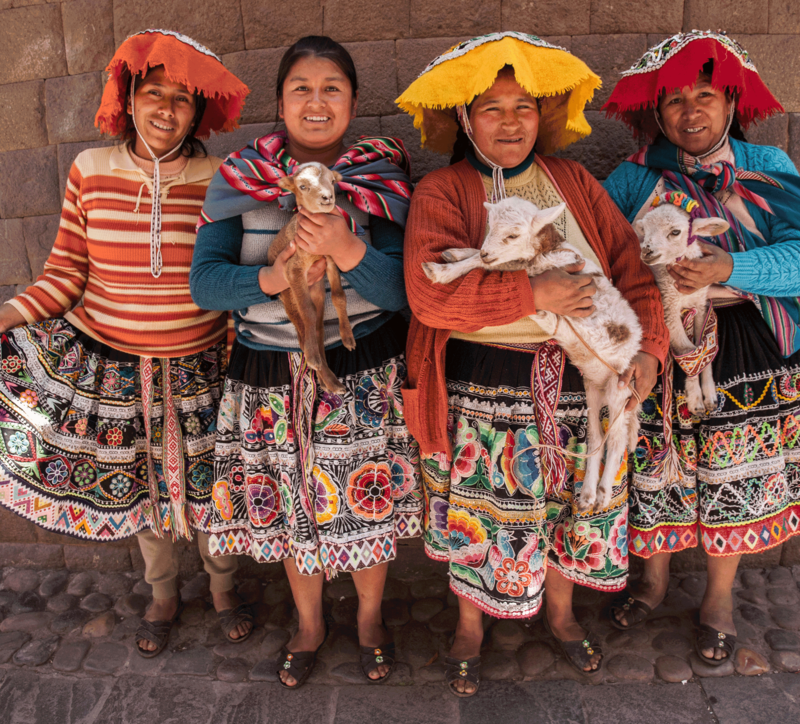 For a full day exploring you can head down to Pisac and see all the products being sold at the local market. Don’t forget to hassle for the prices as they tend to begin with a higher price. Pack for all types of weather… it’s normal to have rain and sunshine even at the same time!